Time zone: Atlantic Daylight Time. When entering New-Brunswick from Maine (USA) or Québec, set your watch ahead one (1) hour. Centers: Visitor Information Centers are indicated by a on the New-Brunswick Travel Map and along provincial highways. Note that in N-B, Route 2 is also called the Trans-Canada Highway (TCH). 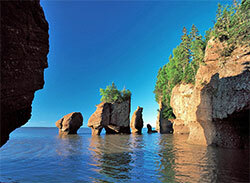 Sales tax: New-Brunswick has a (single rate) Harmonized Sales Tax (HST) of 15% applied to a base of goods and services. HST rebate forms are available at al provincial visitor information centers and the New-Brunswick duty-free shops at Woodstock, Clair and Saint-Leonard (see "Customs" below for phone numbers).